I recently read Andy B. King’s book Website Optimization and was surprised by some of the statistics in it. It shows that there’s a very clear connection between page load times and conversion rates. Statistics from Google and Amazon show that an increase in load time has a direct and profound impact on user engagement. For Google an increase in page load time from 0.4 second to 0.9 seconds decreased traffic and ad revenues by 20%. For Amazon every 100 ms increase in load times decreased sales with 1%. I’m surprised that such relatively small changes in load times had such a massive impact on conversion rates. These statistics makes me even more convinced that speed is one of the most important factors for how users experience your application/web site. According to Andy speed is crucial for engaging the user. A rule of thumb have been that if page load time exceed 8 to 10 seconds, the user’s frustration increases. Newer research has shown that about a third of all broadband users are reluctant to wait more than 4 seconds for a web page to load. 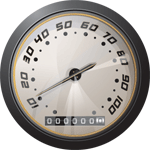 For narrowband users almost half of them won’t wait more than six seconds. It has always been important to optimize for speed, but maybe it’s even more important now than before. The audience is more demanding and the competition is harder. A great start if you want to learn more about how to optimize your site is Andys book, Website Optimization. Do you have a link to these numbers? Highly interesting, but what are your sources? Well as I state in the article the numbers are from page 48 in Andy King’s book “Website Optimization”. Thanks for sharing this piece of information. Would you give us more optimization examples ? Performance counts « Simon Kenyon Shepard :: justLikeThat. ??? » Blog Archive » ????????10?????? Alexander Walther » Was ist Qualität: Responsive oder Responsible?